1. You are accustomed to the notion that the mind can see the source of pain where it is not. The doubtful service of such displacement is to hide the real source of guilt, and keep from your awareness the full perception that it is insane. Displacement always is maintained by the illusion that the source of guilt, from which attention is diverted, must be true; and must be fearful, or you would not have displaced the guilt onto what you believed to be less fearful. You are therefore willing to look upon all kinds of "sources," provided they are not the deeper source to which they bear no real relationship at all. 2. Insane ideas have no real relationships, for that is why they are insane. No real relationship can rest on guilt, or even hold one spot of it to mar its purity. For all relationships that guilt has touched are used but to avoid the person and the guilt. What strange relationships you have made for this strange purpose! And you forgot that real relationships are holy, and cannot be used by you at all. They are used only by the Holy Spirit, and it is that which makes them pure. If you pre-empt for your own ends what you should have given him, he cannot use it for your release. No one who would unite in any way with anyone for his individual salvation will find it in that strange relationship. It is not shared, and so it is not real. 3. In any union with a brother in which you seek to lay your guilt upon him, or share it with him or perceive his own, you will feel guilty. Nor will you find satisfaction and peace with him, because your union with him is not real. You will see guilt in that relationship because you put it there. It is inevitable that those who suffer guilt will attempt to displace it, because they do believe in it. Yet though they suffer, they will not look within and let it go. They cannot know they love, and cannot understand what loving is. Their main concern is to perceive the source of guilt outside themselves, beyond their own control. 4. When you maintain that you are guilty but the source of your guilt lies in the past, you are not looking inward. The past is not in you. Your weird associations to it have no meaning in the present. Yet you let them stand between you and your brothers, with whom you find no real relationships at all. Can you expect to use your brothers as a means to "solve" the past, and still to see them as they really are? Salvation is not found by those who use their brothers to resolve problems that are not there. You wanted not salvation in the past. Would you impose your idle wishes on the present, and hope to find salvation now? 5. Determine, then, to be not as you were. Use no relationship to hold you to the past, but with each one each day be born again. A minute, even less, will be enough to free you from the past, and give your mind in peace over to the Atonement. When everyone is welcome to you as you would have yourself be welcome to your Father, you will see no guilt in you. For you will have accepted the Atonement, which shone within you all the while you dreamed of guilt, and would not look within and see it. 6. As long as you believe that guilt is justified in any way, in anyone, whatever he may do, you will not look within, where you would always find Atonement. The end of guilt will never come as long as you believe there is a reason for it. For you must learn that guilt is always totally insane, and has no reason. The Holy Spirit seeks not to dispel reality. If guilt were real, Atonement would not be. The purpose of Atonement is to dispel illusions, not to establish them as real and then forgive them. 7. The Holy Spirit does not keep illusions in your mind to frighten you, and show them to you fearfully to demonstrate what he has saved you from. What he has saved you from is gone. Give no reality to guilt, and see no reason for it. The Holy Spirit does what God would have him do, and has always done so. He has seen separation, but knows of union. He teaches healing, but he also knows of creation. He would have you see and teach as he does, and through him. Yet what he knows you do not know, though it is yours. 8. Now it is given you to heal and teach, to make what will be now. As yet it is not now. The Son of God believes that he is lost in guilt, alone in a dark world where pain is pressing everywhere upon him from without. When he has looked within and seen the radiance there, he will remember how much his Father loves him. And it will seem incredible that he ever thought his Father loved him not, and looked upon him as condemned. The moment that you realize guilt is insane, wholly unjustified and wholly without reason, you will not fear to look upon the Atonement and accept it wholly. 9. You who have been unmerciful to yourself do not remember your Father's Love. And looking without mercy upon your brothers, you do not remember how much you love him. Yet it is forever true. In shining peace within you is the perfect purity in which you were created. Fear not to look upon the lovely truth in you. Look through the cloud of guilt that dims your vision, and look past darkness to the holy place where you will see the light. The altar to your Father is as pure as he who raised it to himself. Nothing can keep from you what Christ would have you see. His will is like his Father's, and he offers mercy to every child of God, as he would have you do. 10. 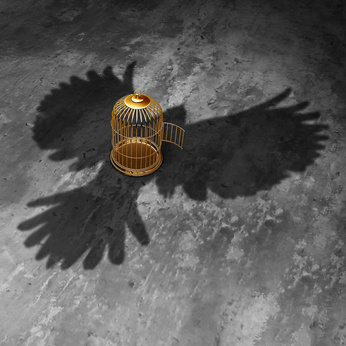 Release from guilt as you would be released. There is no other way to look within and see the light of love, shining as steadily and as surely as God himself has always loved his Son. And as his Son loves him. There is no fear in love, for love is guiltless. You who have always loved your Father can have no fear, for any reason, to look within and see your holiness. You cannot be as you believed you were. Your guilt is without reason because it is not in the Mind of God, where you are. And this is reason, which the Holy Spirit would restore to you. He would remove only illusions. All else he would have you see. And in Christ's vision he would show you the perfect purity that is forever within God's Son. 11. You cannot enter into real relationships with any of God's Sons unless you love them all and equally. If you single out part of the Sonship for your love, you are imposing guilt on all your relationships and making them unreal. You can love only as God loves. Seek not to love unlike him, for there is no love apart from his. No one who condemns a brother can see himself as guiltless and in the peace of God. If he is guiltless and in peace and sees it not, he is delusional, and has not looked upon himself. Behold the Son of God, and look upon his purity and be still. In quiet look upon his holiness, and offer thanks unto his Father that no guilt has ever touched him. 12. No illusion that you have ever held against him has touched his innocence in any way. His shining purity, wholly untouched by guilt and wholly loving, is bright within you. Let us look upon him together and love him. For in love of him is your guiltlessness. But look upon yourself, and gladness and appreciation for what you see will banish guilt forever. I thank You, Father, for the purity of Your most holy Son, whom You have created guiltless forever. 13. Like you, my faith and my belief are centered on what I treasure. The difference is that I love only what God loves with me, and because of this I treasure you beyond the value that you set on yourself, even unto the worth that God has placed upon you. I love all that he created, and all my faith and my belief I offer unto it. My faith in you is as strong as all the love I give my Father. My trust in you is without limit, and without the fear that you will hear me not. I thank the Father for your loveliness, and for the many gifts that you will let me offer to the Kingdom in honor of its wholeness that is of God. 14. Praise be to you who make the Father one with his own Son. Before the glorious radiance of the Kingdom guilt melts away, and transformed into kindness will never more be what it was. Every reaction you experience will be so purified that it is fitting as a hymn of praise unto your Father. See only praise of him in what he has created, for he will never cease his praise of you. United in this praise we stand before the gates of Heaven where we will surely enter in our sinlessness. Could I, then, lack faith in you and love him perfectly?